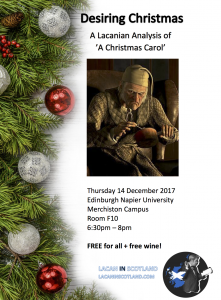 Join us for a seminar in preparation for the festive season, where Claudia Di Gianfranscesco (BA/hons student at Edinburgh Napier University) will give a Lacanian psychoanalytic analysis of ‘A Christmas Carol’, based on Charles Dickens’ novel and Robert Zemeckis’ (2009) movie adaptation of it. How does the story shed light on psychoanalytic concepts such as desire, the subject and the function of the symbolic? And what is so appealing about the story that it has become so popular? No previous knowledge of Lacanian theory is necessary. BYOB for further alcoholic indulgence.